You are here: Home / Marketing / Email Marketing / Are you Sending Spam Emails Unknowingly? Multinational companies even don’t understand the concept of Email spam and send emails which are actually spam. Let me first clarify what is an email spam with an example? 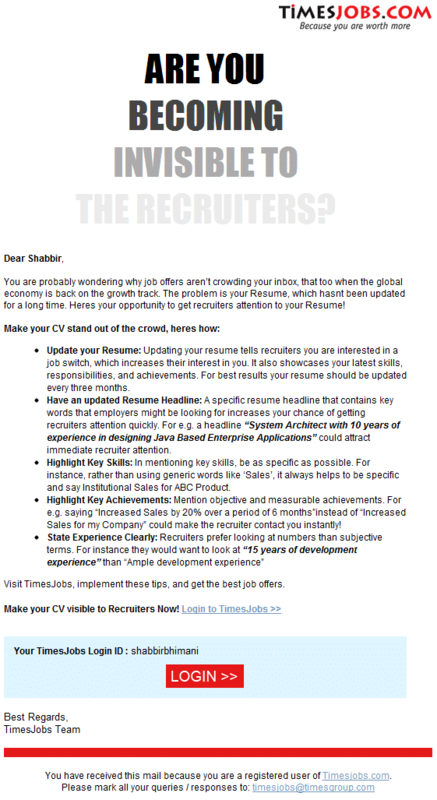 Yesterday I got an email from TimesJobs.com – A Job portal where I registered few years back. See the email I received from them. Click on image to view the complete Email. Tell recipients how to opt out of receiving future emails (unsubscribe). Tell recipients where you’re located i.e. a valid physical postal address. Email from Timesjobs has neither. They don’t have their physical postal address nor offer any unsubscribe link in the email and so according to CAN SPAM Act this is spam. 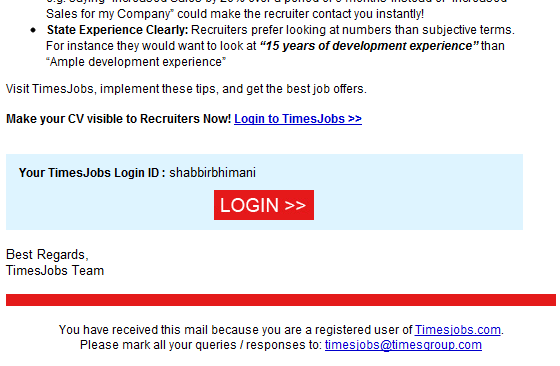 Yes I do agree that I registered at Timesjobs.com but that does not allow them to spam me for the rest of my life? Priorities changes for user. I am not looking for jobs and on the flip side I am looking to hire people. If I remember correctly I was not looking for a job switch even in 2006-2007 when I joined my so called last job. I have not logged on to any job site for years and still get emails from majority of the job sites because I registered with them few years back. As a business I prefer AWeber which apart from handling all those issues of being compliance with CAN SPAM Act can allow you to have list of inactive users i.e. users who have no activities for some months / years. You can create segment users who are inactive. Notify them that due to inactivity for such a long period their emails are being deleted. You will see more unsubscribe from these segment of users but users like me who don’t have the time to open those emails can safely be removed from your list to create more active and responsive list of users. So are you sending spam Emails unknowingly?